There’s nothing nicer than taking the afternoon off for adventure and many of our first guests have commented about the special feel of Nightfall’s Platypus Pond, not far from the camp’s main lounge and swimming hole. Platypus Pond is named after the elusive monotreme which, if you pick the right time of day, can occasionally be seen all along our Christmas Creek headwaters. The secluded swimming spot is a gentle 500m rock-hop from Nightfall’s main camp. 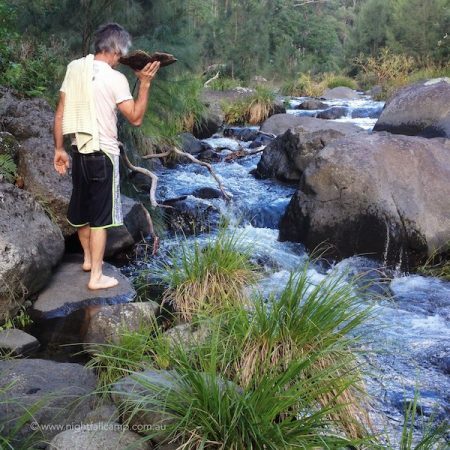 Depending on the height of the creek, in most parts you can also choose to walk beside the water. 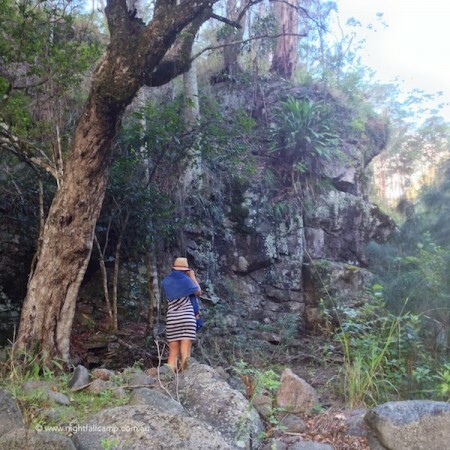 Along the way sections of Queensland gallery rainforest meld with dramatic vertical sheets of rock. Look closely and you’ll spot a range of orchids, giant figs and other treasures. The flow from Nightfall’s spring-fed waterfall also joins the creek a little way from the camp. A vertical rock face at the creek edge and deep water herald your arrival at Platypus Pond. Here the creek is often over three-metres deep. 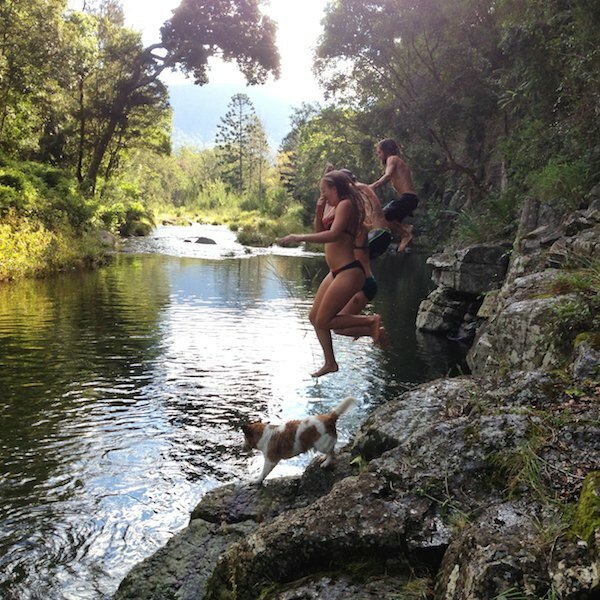 It’s fun to jump from the cliffs into the deep water, but please make sure to check before for obstacles and boulders below the surface (they occasionally come down from neighbouring Lamington National Park when the creek floods) . 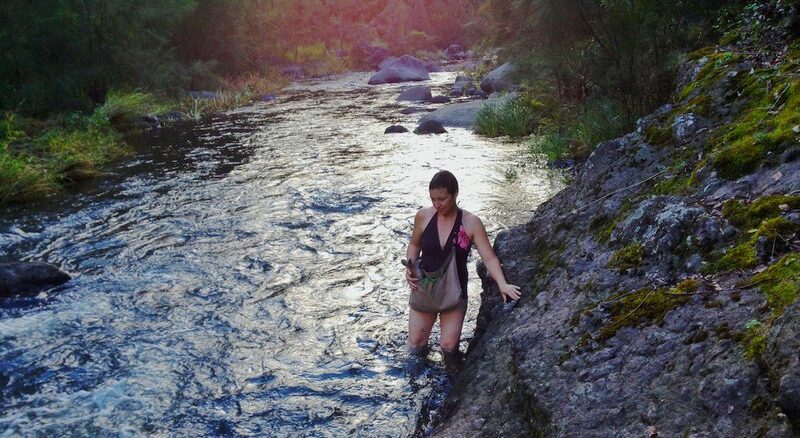 Platypus Pond is one of many secret spots along Nightfall’s private 1.5km Christmas Creek frontage. 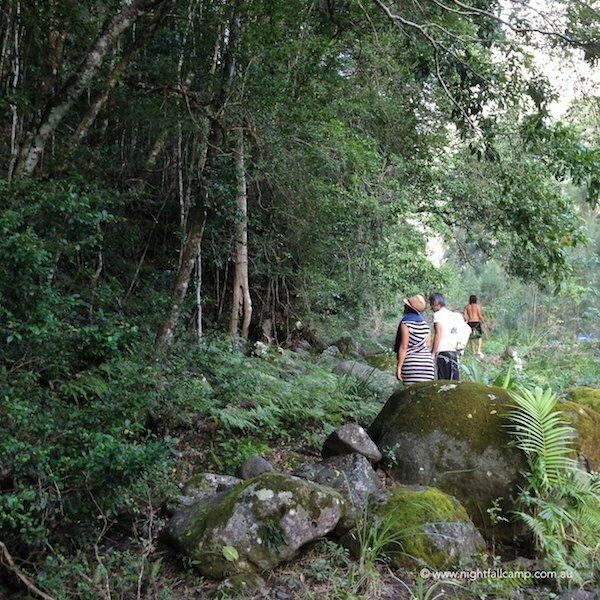 (images: top – Nightfall host Heidi and resident wallaby joey Lillypilly negotiate a rocky outcrop along the journey (creek level higher than average); middle – gallery rainforest along the way; bottom – Nightfall host Steve collects the perfect bark serving bowl (post-flood treasures) and the thrill of plunging into the depths of Platypus Pond on a hot afternoon.